Welcome 2018. I wish you all a very happy healthy new year! 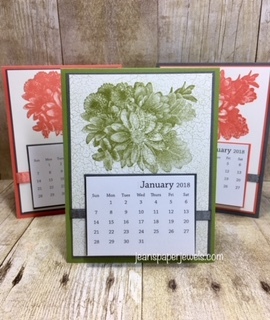 I am making calendars for my friends, and Stampin' Up! downline. I used two FREE items from the upcoming Sale-A-Bration event. It starts in just a couple of days on January 3, 2018. The main flower image is from Heartfelt Blooms. This set of four comes with three lovely script sentiments. I also used two of the ribbon colors from the Shimmer Ribbon Pack. It comes with three spools of 5 yards each: Basic Gray (1/4" wide), Bermuda Bay (1/8" wide), and Calypso Coral (3/8" wide). You can select a FREE item with each $50 you spend between Jan. 3 and March 31, 2018! (2 items with a $100 order, 3 items with a $150 order, etc.). Check out the Sale-a-Bration brochure for your choices, and a few reminders: NO LIMITS!, AND check out the $100 level choices on pages 17 and 19... you can select one of those instead of 2 of the $50 level gifts if you wish! Thanks for joining me today! Enjoy your first day of 2018.